When REVERB started our partnership with Martin Guitars in 2016, it was one of the most exciting days of my career. For a kid who grew up listening to my heroes calling out for the world to change with nothing but their voice and an old worn D-28, the chance to work alongside the team assembled in Nazareth, PA was a dream come true. The first time I visited the Martin Guitars Factory and Museum it was like visiting Santa’s workshop. I have to admit I had trouble keeping it together. The museum is filled with guitars from the over 100 year history of the brand including some of the ACTUAL instruments many of my heroes played. Come on, I played Grandpa – Kurt Cobain’s D-18 – with my own two hands?!? But what was possibly even crazier was my experience visiting the Winter NAMM show in Los Angeles with REVERB’s Community Manager, Paige, to partner with Martin Guitars. When Paige and I arrived at the show (after literal hours waiting in line to park and get credentials) it was overwhelming. What does 120,000 people in a single convention center look like? Apparently NAMM. It’s a time capsule of music gear and the folks who use/own/sell/maintain it from every era for the last 60 years…what happened to the guitar tech from Stryper? Oh, he was there. And the lady who made all of Bootsy Collins’ sequined platform boots? Yep her too. This amazing collection of the most interesting humans (and a few aliens) I have ever seen, paired with the biggest collection of amazing gear I have ever been in the presence of…I knew I was in for something special. The wonder of a 40-year old man child aside, REVERB was at NAMM for an important reason. Not unlike other trade shows (or any other large-scale event), the NAMM convention creates a lot of waste. While (this year at least) REVERB did not have the chance to address the waste footprint of the show as a whole, we did have an opportunity to work alongside our partners at Martin to help encourage a different way of thinking and reduce single-use waste in the process. One big piece of the trade show waste puzzle is single-use plastic water bottles. Hundreds of thousands of attendees means lots of thirsty people and traditionally lots of single-use plastic water bottles. REVERB and Martin Guitars worked to reduce this waste by providing free water fill-up stations to visitors to the Martin Guitars display as an alternative to expensive bottled water. But we didn’t stop there! REVERB, in partnership with Nalgene USA, created custom Martin Guitar #rockNrefill water bottles for NAMM visitors to use while at the show. The bottles were available for a $5 donation benefitting the NVCF California Fire Relief effort. Everyone that donated was also entered to win a beautiful Martin OMC Guitar signed by REVERB partner Willie Nelson! 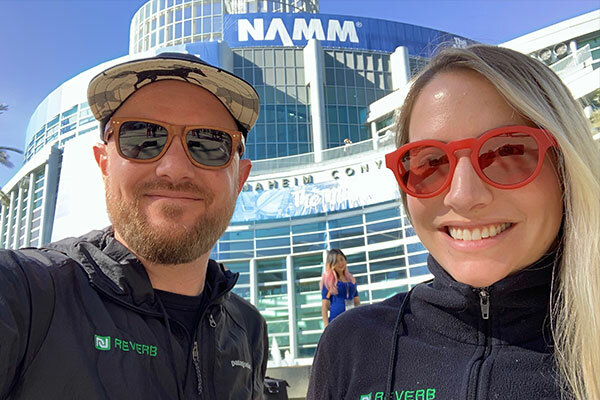 At the end of the show, REVERB had connected with hundreds of NAMM attendees, raised over $1,100 for the North Valley Community Fund, and helped attendees avoid using over 3,300 single-use plastic bottles. That’s a WIN from REVERB’s perspective! All of us at REVERB are excited to partner with Martin Guitars for our 2019 season. Stay tuned and check back at REVERB.ORG for more opportunities to get involved and learn how you can win a Martin guitar!